Make this delicious twist from Mama Robin’s Instant Pot Mississippi Pot Roast Recipe (Pressure Cooker Mississippi Pot Roast) that took the internet by storm! 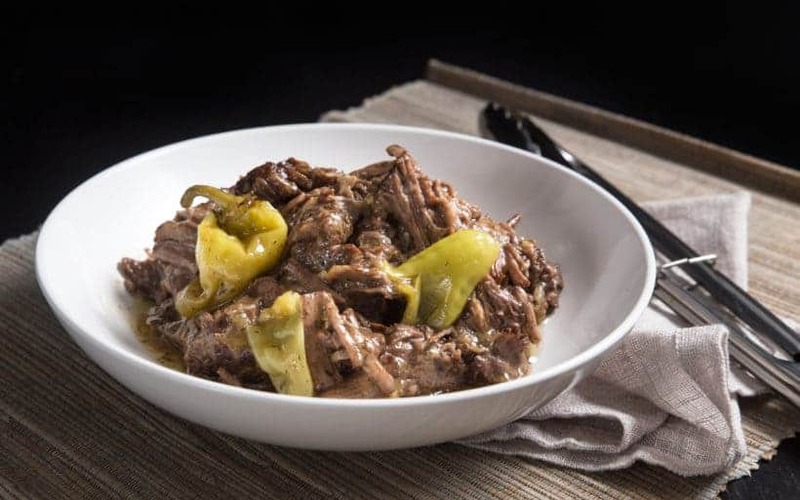 Families are obsessed with this comforting pepperoncini beef roast with minimal prep. We love hearing from our dear readers and it’s always fun reading your wonderful stories, heartfelt encouragements, and words of love!! Some of you might wonder, what exactly is Mississippi Pot Roast? Mississippi Pot Roast has probably become one of the most popular recipes on the internet! Why are people so crazy about it? How did it get so viral? What magical powers does it posses? Mississippi Roast is essentially flavorful comfort food with almost zero prep. whaaa?? Tell me about it! Robin Chapman is the creator of the original Mississippi Pot Roast Recipe. She adapted a roast beef recipe that was too spicy for her young kids, and this was the moment the ever so famous Mississippi Roast was born. Instructions: Put roast in slow cooker. Place butter, pepperoncini peppers, ranch dressing mix, and au jus mix on top of the roast. Cook on Low for 8 hours. The ingredients & simple instructions might be a shocker, but her family & friends loved this roast, and they couldn’t stop raving about it. This has led one of her friends to contribute this recipe into a cookbook put together by her church. And the snowball effect began. From the little cookbook that led to being published on a food blog, then many other mom blogs, which then spread like wildfire all over the internet. Little did she know this super simple recipe would lit the internet on fire and storm into American homes nationwide! So, instead of using Dry Ranch Dressing Mix packet & Dry Au Jus Mix packet, we’re opting to mix our own Herbs, Spices & Seasonings. The tender beefy beef is so rich & buttery, packed with spicy & deep savory flavors. Love the aroma and flavors that linger in our mouth. Seriously comforting to eat!! *Pro Tip: This promotes maillard reaction and prevent excessive moisture loss. When the pressure cooker is hot, lightly season the chuck roast with kosher salt and ground black pepper. *Pro Tip: It’s important to be light on the seasoning at this step – reduce the usual amount you use to season chuck roast. Add 1 tbsp (15ml) olive oil in pressure cooker. Ensure to coat the oil over whole bottom of the pot. Season the other side with salt & black pepper. Brown for 8 mins on each side without constant flipping. Pour in ¾ cup (188ml) unsalted chicken stock and completely deglaze bottom of the pot with a wooden spoon. Stir in 1 tsp (2.4g) onion powder, 1 tsp (2.8g) garlic powder, 1 tsp dried dill weed, 1 tsp dried parsley flakes, and 1 tsp dried or fresh chives. Mix well. Partially submerge chuck roast steak and 3 – 5 (45g – 70g) pepperoncini peppers in the cooking liquid. Pour in the meat juice. 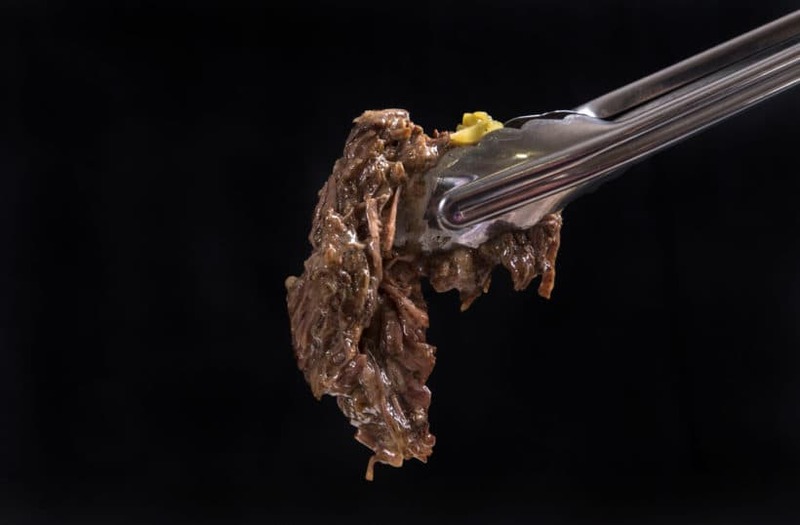 Layer ¼ cup (63g) unsalted butter on top of the chuck roast steak. Set aside the Mississippi roast on a serving plate. 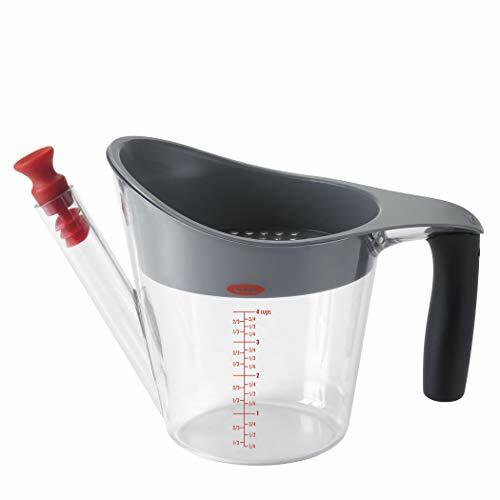 Separate the fat with a fat separator. Press Cancel Button, then Sauté Button to heat up the sauce in the pot. In a glass measuring cup, mix 2 tbsp (18g) cornstarch with ¼ cup (63g) buttermilk and mix it in one third at a time until desired thickness. Taste and adjust the seasoning with kosher salt and black pepper if necessary. Add pressure cooked chuck roast steak back into the thickened sauce. Serve the Instant Pot Mississippi Pot Roast with your favorite side dishes. 1. Why are we browning the chuck steak as a whole? Chuck roast is one of the most suitable cuts for pressure cooking. For optimal result, choose one that is well marbled!! This is very critical. Make this delicious twist to Mama Robin's Instant Pot Mississippi Pot Roast Recipe (Pressure Cooker Mississippi Pot Roast) that took internet by storm! 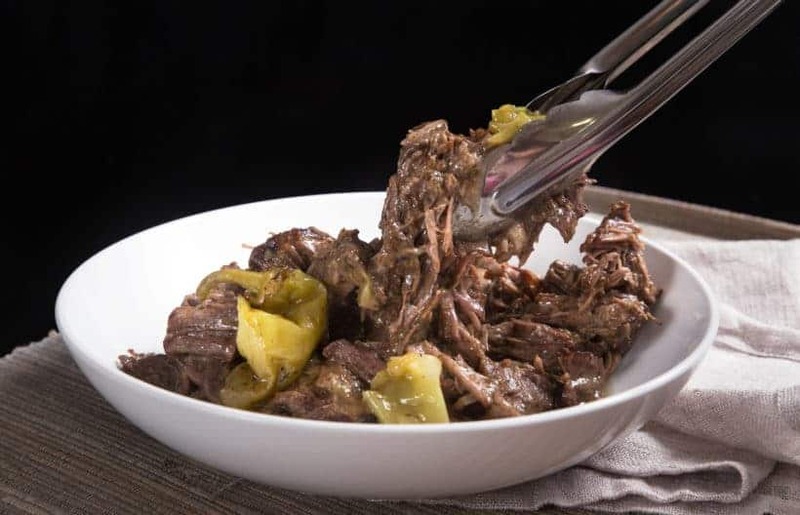 Families are obsessed with this comforting pepperoncini beef roast with minimal prep. Prepare Pressure Cooker: Heat up your pressure cooker (Instant Pot: press Sauté button and click Adjust button to go to Sauté More function). 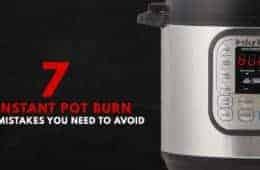 Make sure your pot is as hot as it can be when you place the chuck roast in the pot (Instant Pot: wait until the indicator says HOT). This will promote maillard reaction and prevent excessive moisture loss. 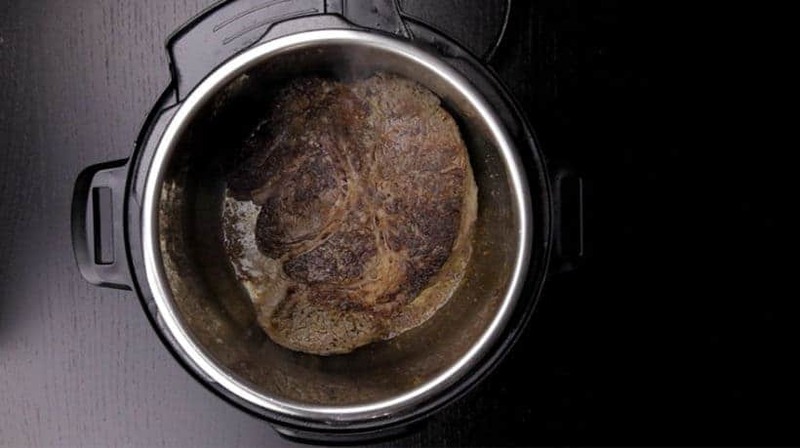 Prepare Chuck Roast Steak: Pat dry with a paper towel. When the pressure cooker is hot, lightly season the chuck roast steak with kosher salt and ground black pepper. Deglaze: Pour in ¾ cup (188ml) unsalted chicken stock and completely deglaze bottom of the pot with a wooden spoon. 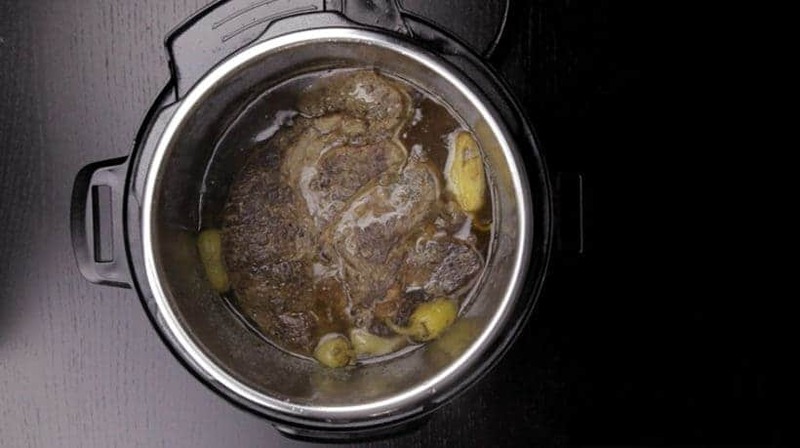 Pressure Cook Pot Roast: Stir in 1 tsp (2.4g) onion powder, 1 tsp (2.8g) garlic powder, 1 tsp dried dill weed, 1 tsp dried parsley flakes, and 1 tsp dried or fresh chives. Mix well.Partially submerge chuck roast steak and 3 - 5 (45g - 70g) pepperoncini peppers in the cooking liquid. Pour in the meat juice. 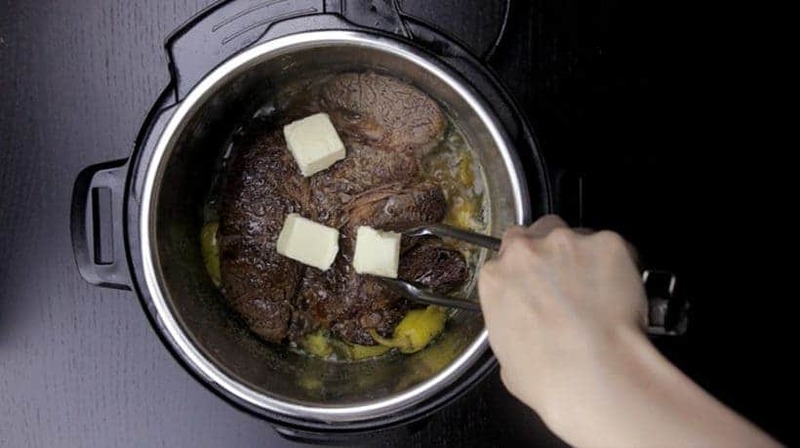 Layer ¼ cup (63g) unsalted butter on top of the chuck roast steak. Close lid and pressure cook at High Pressure for 45 minutes + Full Natural Release (~roughly 20 minutes). Open the lid carefully. Set aside the Mississippi roast on a serving plate. Optional Step: Separate the fat with a fat separator. Thicken Sauce: Press Cancel Button, then Sauté Button to heat up the sauce in the pot. In a glass measuring cup, mix 2 tbsp (18g) cornstarch with ¼ cup (63g) buttermilk and mix it in one third at a time until desired thickness. Taste and adjust the seasoning with kosher salt and black pepper if necessary. Serve: Serve the Instant Pot Mississippi Pot Roast with your favorite side dishes. Enjoy! I made the Instant Pot Mississippi Pot Roast almost exactly as written. I forgot to put a little of the pepper brine in the pot – newby mistake. It turned out fabulous anyway. Made this tonight and it was delicious. Will definitely make again soon. Made your baked potatoes to go with it. Had planned to serve carrots as well but ran out of time and they were not missed. I have made several of your recipes and they were all hits. Many thanks for your hard work. It is much appreciated. Learning so many new cooking skills at age 89. This is, without a doubt, the best tasting pot roast I’ve ever made! I cooked it last Sunday and am making it again today. Question, I bought two roasts, one is 3lbs the other is 2.5lbs, can I cook them both at the same time? If so, do I just double the ingredients? TYVM! If you can place them side by side, the cooking time will be the same. No need to double the liquid ingredients. Reliably delicious and simple. The first time I tried it, it came out wonderfully, and now it is a go-to favourite – we enjoy it over creamy mashed potatoes. thanks for doing the legwork that resulted in such a great recipe for such a revolutionary cooking appliance! Thank you for your question. You can place large chunks of potatoes in a stainless steel bowl and layer it on top of everything. This is my favorite instant pot meal by far! I make it as is and it’s always amazing. Dont skip the buttermilk! My favorite MS Pot Roast. I don’t like using processed gravy mixes due to the sodium, and this recipe doesn’t use them. It’s also the best recipe I’ve tried. After mixing together the (cold) corn starch slurry mixture I would suggest tempering it with a ladle of the liquid from the InstantPot and mixing that well. This should make the thickener easier to incorporate when added to the InstantPot liquid. Thank you for sharing your cooking experience with us. I had made the original version of this in a crockpot. Loved it but not all the butter and sodium filled packets. Got a Instant Pot for Christmas and searched for my first recipe to try. Found your healthier version and decided to go for it. So happy I did! My first use of the Instant Pot was a success and the meat was fabulous!! Your clear directions for this novice made all the difference. Thank you! Thank you for your question. I recommend increasing the broth by 25% and the spice ingredients by 50%. The cooking time will stay the same. My wife and I are making this now. The only confusing part was when you said to, “Pour in the meat juice”. Since we were never told to take out the meat juice, we added the broth to it and deglazed the pot, thus the juice was already in. Am I missing something? Thank you for your question. The chuck roast will release some of it’s juice when you set it aside after browning. So just pour those meat juice back in when you are placing the chuck roast back into the Instant Pot. Hi! I am looking forward to trying this recipe! I’m in a situation where I have to prep this in the morning before I leave for the day, and finish it quickly when I get home before our company arrives. It will be in the pot for 9 hours total. (1 hour pressure, 8 hours warm) Will this totally turn it to mush or dry it out? Do you have any suggestions for making this work? 🙂 Thanks! Thank you for your question on the recipe! It will dry it out so perhaps using the slow cooker function to slow cook it is a better option. Best pot roast I’ve made in a VERY LONG time! So much better than the crockpot version. Everyone loved it. Can this Mississippi Roast recipe be cooked and then frozen for future dinners? Love your site! This will be the first time cooking meat in my new Instant Pot! How long would I cook two chuck roasts totaling 3.4 pounds and are each about 1’inch thick? Do I stack them? Do I need to use a trivet? Do I need to brown them separately? Do I need to cut them in big chunks and brown all together? Many thanks! Do I stack them? Do I need to use a trivet? I recommend placing them side by side partially submerged in the liquid. Do I need to brown them separately? You can brown them both together. Does it need to be on sealing or venting? When pressure cooking, the Instant Pot will always have to be on sealing. Not sure if I did something wrong. I followed the recipe for 45mins high pressure. And I felt like it came out tough and not like melt in your mouth as I expected. Should I just do it longer next time? But then I read you said it loses flavor. thank you for your comment. Sorry to hear what happened. Do you remember the cut of meat you used? Was the meat dry? Hi! I am really looking forward to cooking this recipe. My 2 year old does not tolerate any spice. If I completely left out the pepperchinis would it ruin the flavor of the dish? It will be fine without the pepperchinis. I would suggest substituting mild giardiniera (Italian mixed pickled vegetables), mild pickled peppers, or any pickled vegetable that cooks well. You want to get that sightly tangy flavor that this pot roast is known for. I have always made healthier version of this in the slow cooker, but I do 4-5 lbs of bottom round roast over the chuck for 8 hours. I prefer the texture. However they are usually much thicker even after trimming some excess fat. I saw your reply to another post about increasing the time. If I use 4-5 lbs and it is thicker, should I add more time as you suggested to like 60 minutes, or cut into pieces that resemble your thickness and use the same time? Or another thought you may have? I love my recipe and it is slightly different, but similar healthier swaps for the packets and paleo for me. There are so many subs for the dairy!! And BTW, your IP hard/soft boiled egg recipe is the only one that works for me if the eggs don’t touch!! Both ways will work! Cutting into pieces to resemble the thickness will work better as the outer layer of meat can get overcooked with longer pressure cooking time. I’ve noticed that you always used chicken broth with beef recipes. Is there a reason you don’t use beef broth? So flavor filled and tender. It wins the prize for me! Thanks so much for posting this recipe. I used your version — with the spices rather than pre-made packets. I’ve only been cooking for about 9 months now — and I decided to buy an Instant Pot, hoping it would save me time as an elementary school teacher. This is the first recipe I’ve tried and the first time I used my Instant Pot — why I did not pick something simpler? My boyfriend and I were both wondering, haha. Your directions were concise and really helped me follow everything step-by-step. My only confusion was when you said to add the meat juice, not sure what was meant by that since all the liquids were already in the Instant Pot at that point. Regardless, everything came out wonderfully! As someone who doesn’t even like spicy foods — I am thinking of adding more than 4 pepperoncinis next time, as it adds an extra kick. Thanks for inspiring me to be adventurous in my cooking; I’ve never made pot roast before and this was a success. My boyfriend couldn’t stop raving. Thanks Amy and Jacky — you’ve gained a fan. The meat juice is the drippings from the browned roast. Hi thanks for the quick reply ! I had planned on purchasing a chuck roast and cubing it for the beef tips . But if I don’t cut it up and decide to purchase a larger roast to make this recipe again , do you have to increase the time and ingredients ? Like a 3-4 lb roast . 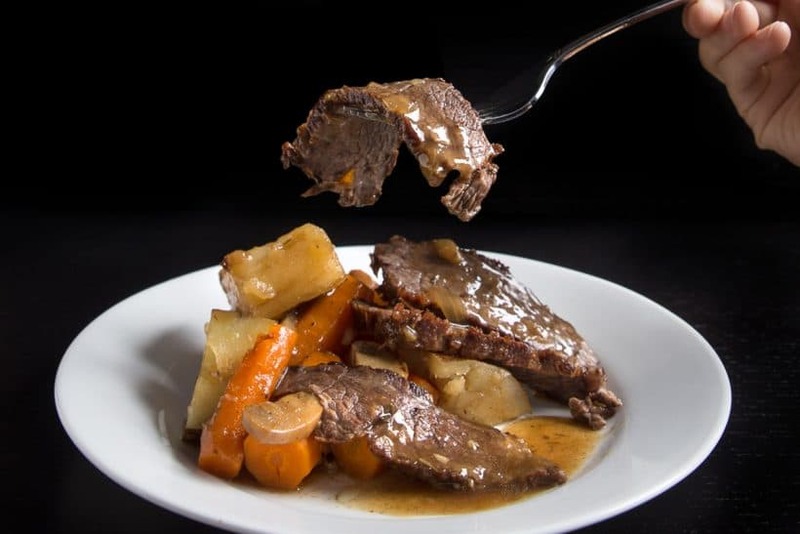 If i want to use this recipe ( because it taste amazing) but cut up the roast for beef tips and gravy , what would be the time to pressure cook them? Beef tip is not the most ideal cut, but it will take roughly 12 minutes and 12 minutes natural release. What is the best type of roast to use? Thank you! Chuck roast works the best for this recipe. Amy Jacky Going to make the roast in the 8 Quart, do I need to up the liquid??? Have a 2 Pound roast per your recipe. Just have liquid question with the bigger pot. The liquid can stay the same for the 8 quart Instant Pot. Love this! I try to keep cooking with processed food to a minimum. As soon as I see to add a packet of anything, I’m out. Can’t wait to try this. Hey there. My roast is 3.195 pounds. Do I need to adjust any amounts or times to cook it? It is also thicker than 2 inches. Thank you. If the roast is a little thicker than 2 inches, then the cooking time will be fine. If it is about 1/4 inch thicker, I would increase the cooking time by 5 – 6 minutes. Why are you using chicken broth for beef pot roast? I have tried both and find beef broth or bouillon much more tastefull. Store-bought chicken stock usually tastes a lot better than store-bought beef stock. It is a lot harder to find good quality store-bought beef stock, that is why we decided to use chicken stock as most people don’t have homemade beef stock on hand. If you have homemade or good quality store-bought beef stock, I would recommend those. Made this finally last night and it was absolutely delicious and very easy! 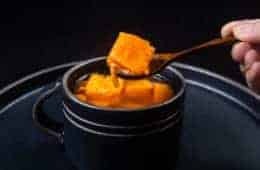 I like that I usually have all the ingredients on hand and that you have found a way to eliminate the use of unhealthy seasoning packets and canned soup (as in the old original recipe). The sauce was so flavorful–I put it on top of leftover wide noodles sautéed in butter with cremini mushrooms (great combo, especially with the sauce that was sooooo good it could be a new beverage! :-). I really appreciate that you gave the exact time to brown the roast, which eliminated guesswork and having to check the meat. Eight minutes per side is perfect–the meat was such a lovely color–just like your picture–and I know that really added to the flavor. 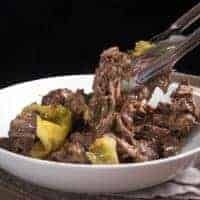 This type of recipe gives a lot of flexibility for the cook–I had other things to do so let the Instant Pot keep the meat warm until I was ready to continue with the meal. Thanks for a recipe that I’ll be sure to make over and over! Thank you so much for your kind words on this recipe!! Bought pkg of 2 bottom blade(Canadian,eh)roasts at Costco. Each was over 2 lb. Tried this tonight and it was a hit with picky husband and cooking school grad son. It was not break-apart tender, so I have a few questions, specially since I want to do the 2nd tomorrow night for company! Since I live at +3000 ft. I added 5% (2 min. )to pressure cooking time; correct? Both roasts, unlike yours are nearly as tall as they are wide, i.e., 3-4” high. So I sautéed on all sides; mistake? I could have laid it on its side to cook but not sure it would have submerged more of the surface area or not; suggestions? Since the roast is thicker than 2″, it will require a longer cooking time. Roughly 58 – 60 minutes with +3000 ft.
Browning all four sides are fine, but the impact is minimal. Just browning two sides will be fine if you want to save some time. Hi there. Love your recipes. I am just wondering why chicken stock and not beef stock for this recipe. We just kind of broke it apart with a wooden spoon after we put it back in the gravy. I could not get to subscribe as it just kept spinning all the time I was here at least 13 minutes. Maybe you could “hand” subscribe me for your newsletters?? I just checked in the system, your subscription request has gone through! Please check your email inbox for the confirmation email – if not it may have gone to the junk mail folder. Let me know if you’re still experiencing issues with it. For those with no buttermilk and who don’t use milk, if you have plain yogurt and there is some whey in the carton, or if you make your own yogurt in the Instant Pot, and then drain it for Greek yogurt, the whey is a perfect substitute for buttermilk. I love this recipe, but we don’t ever use buttermilk (aside from this) and I hate buying it just for it to go to waste. Can the sauce be thickened with water and cornstarch? If so would you still use the 2/3 cup? Thanks! You can use milk and 1 – 2 tbsp of white vinegar instead. Thanks for your response but we don’t drink regular milk (only almond milk or coconut milk) and I wasn’t sure this would have the same effect in making home made buttermilk. Normally we just make a cornstarch slurry with water and cornstarch when thickening recipes. Would this not be an option here? Or would the almond milk work the same? Thanks! Can I use 2% milk as part of the thickener instead ogf butter milk? You will want to add about a tablespoon of vinegar to the milk. Can you use a frozen roast? Longer cook time? A frozen roast will work, but it will not brown properly so the overall dish will not be as flavorful. I would recommend an extra 3 – 5 minutes for this recipe. Banana peppers should work just fine! I’ve seen the original recipe and have heard how good it is, but was always so turned off by the packets of dry mix. Even though they taste good, I’d just rather not use them. I really appreciate the work (and love) you put into your recipe development. We will be looking forward to your feedback on this recipe! I would like to try this recipe because of all the raves…but I loathe dill anything and am not crazy about those pepper thingys. Can I leave the dill out and it will still be tasty? Im really scared to try it!?!? Thanks for your thoughts! You can leave out the dill and it will still taste pretty good! So I just purchased an Instant Pot and this was the first recipe I made in it. I have prepared the crock pot/packet version and loved it. I felt so much better about this one using real spices instead of the packets. The roast was delicious and and the sauce…YUM. We served the roast and sauce on top of rice. What an easy meal to prepare. I am looking forward to many more nights of Instant Pot cooking! Hi. I am excited to try this today. Can you please elaborate in your response to Shari M Ratner? If I want to cook potatoes and carrots pot-in-pot after the roast, do I put both veg in the same bowl and cook? Does water go into that bowl? Thanks! Sorry for the delay in response as we are in the middle of moving! You can place both the veggies (quartered potatoes and carrots chunks) in the same bowl. Or you can layer the potatoes and carrots on a trivet. 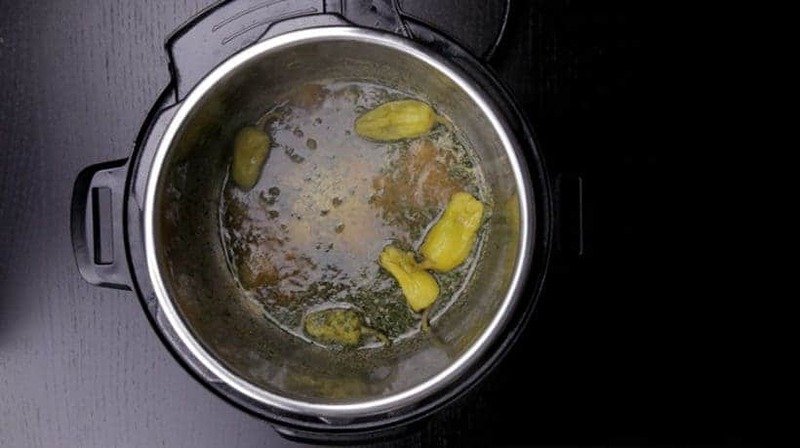 It will take roughly 5 – 8 minutes and quick release with the Pot in Pot method. Water doesn’t need to go into that bowl. Make sure there is liquid at the bottom of the inner pot. Can I use the regular crock pot recipe? yes, you can use the regular crock pot recipe. Just make sure it has at least 1 cup of liquid! I seasoned my roast with only salt, pepper, and dredged it in flour then browned both sides before pressure cooking with a can of French onion soup & the jar of peppers. It came out perfectly thickened …. it was amazing. Oh, I added Beef Stock to mine for that extra beefy flavor. My hubby & son gobbled it up. This is just perfect! Here in Quebec, Canada, the peperoncinis are so tiny, I put 12 and 1/2 cup of the jar liquid. Roasting 8 minutes on each side makes all the difference. Thanks a million for sharing this recipe, this is a keeper for sure! Can I use my home made chicken broth? I did not add salt to it. So would I consider it unsalted? Seems right to me! The homemade chicken broth will be fine! My family loves this recipe cooked in the crock pot. I have yet to try it in my Instant Pot, but will soon. I make one change, I use the sliced peperoncini’s and also use the liquid from the jar. I like the extra kick it gives. From Kitchen/Cooking Phobic to a Rock Star thanks to Instant Pot and Amy and Jacky Pressure Cook recipes. I have only had this since Christmas and it took me a few weeks to get brave enough to try it. Although I bought it for my Husband he was not interested in trying it. I started slow, with your hard boiled eggs, then your mashed potatoes, then the cheesecake and now this! He is eating the Mississippi Pot Roast as I type and he says “its Delicious” He NEVER says that. He is super picky. He has gone from ambivalent to the Instant Pot to loving it. More importantly he says he never has to cook again. 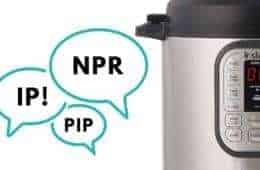 So happy to hear the success you are having with the Instant Pot!! Now we got your husband converted hehe! Thank you, I am so glad to have a substation for the pkgs!! Can’t wait to make it! Good Morning, I have a 3.5 pound eye of round roast, I wanted to try this recipe, but nt sure of the cooking time. It is probably 4 inches thick and 7 inches long…. Help please! Eye of round roast is quite lean and is more suitable to cook in a low temperature oven. If you want to use the Instant Pot, you can use the same cooking time as this recipe. A rib roast is a very tender cut and it would be more suitable for slow roasting in a low temperature oven. Hello! If I just want to use the envelope seasonings for a 2lb chuck roast, would I still use 1 package (1 oz) of Dry Ranch Dressing Mix & 1 package (1 oz) of Dry Au Jus Mix? This was so flavorful! However, I forgot to put the roast back into the thickened sauce – it would’ve made the meat more succulent. After the roast was done cooking, I removed it from the pot and threw in quartered carrots and potatoes for 3 Min (high pressure then quick release). The veggies came out so good! Not overcooked and the carrots even tasted a little candied. I have a question on thickening the sauce. I mixed low fat sour cream (instead of buttermilk) with corn starch and sauteed it into the sauce in three parts. However, the sour cream/corn starch mixture clumped up and hardened into mozzarella-like bits. It wouldn’t dissolve. Was it because the sour cream was low-fat? Or was the sour cream/corn starch ratio off? Could I have used heavy cream or low fat milk in lieu of the buttermilk? The cornstarch was the problem. It needs to be dissolve and mix frequently before adding into hot liquid or it will clump up. It would be better to mix the cornstarch with water and add it into the hot liquid instead of mixing it with the sour cream. 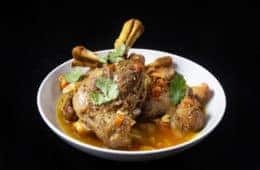 This recipe is amazing, I have been utilizing your recipes routinely and it has turned me into a world class chef amongst my family members. Thank you so much for posting these. Keep the recipes coming. They are AMAZING! So happy to hear the result!! Snowed in here in on the east coast so I made this this afternoon. Omg – so tender! I didn’t have sour cream, yogurt, or buttermilk so I used light cream for the gravy and cornstarch and it thickened up just fine. Your blog is amazing, thanks for all the great recipes. Stay warm and take care!! 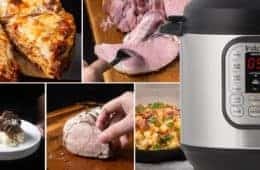 I received an Instant Pot Ultra 60 for Christmas, and have been collecting information on it’s usage and recipes to try. I’m excited to use it, but also a bit intimidated. I just wanted to know, if recipes are usable/ translate between the different models…I haven’t seen too many for just the Ultra; maybe because it’s a newer model, however, this does contribute to the intimidation I feel about using it. Thank you in advance ? The recipes are usable between the different models and even other electric pressure cookers. We have recently learned my husband is lactose intolerant, and I’m wondering if we could omit the buttermilk. We’ve never had a Mississippi pot roast, so I don’t have anything to compare it to. He doesn’t seem to have a problem with butter, fortunately, and I don’t even know if so little buttermilk would cause him grief, but I’d like to try it. Greek yogurt is less lactose than most other dairy products. You can use that as substitutions or you can just omit the buttermilk. I am lactose intolerant also. I use Lactaid milk with a tablespoon of vinegar to substitute for buttermilk. What’s the cooking time for a 3Lb roast ? I have the 8 qt cooker. 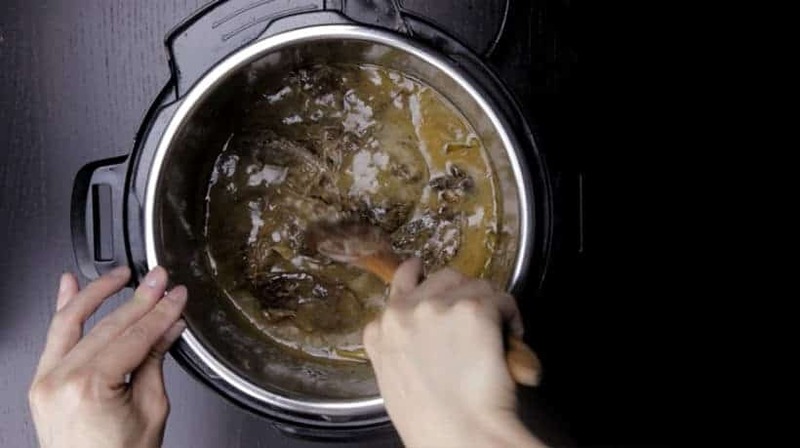 Pressure cooking is mostly dependent on the thickness of the meat. If the 3lb chuck roast is 2″ thick, it will take the same time to cook! What could I substitute the buttermilk with to get a similar result? Thanks for all the awesome recipes!! Sour cream or greek yogurt will work. I would like to make this while I am at church. Is it possible to start it when I leave and allow it to stay on warm? I would be gone for a total of 3 hours. It will work just fine. Just like buffet food, food will gradually get drier when kept at keep warm. This is a seriously delicious pot roast! I did not add buttermilk or thicken the juices for dietary reasons, but the meat was so tender we didn’t miss the gravy. Thank you for another wonderful recipe. Thank you so much for using our recipes and your kind feedback! 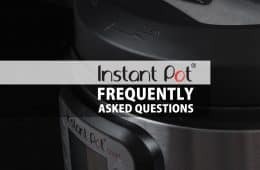 I didn’t include this question in my review because it has nothing to do with the success of the recipe, (which as I reviewed, was delicious), but maybe you could advise me on the use of the instant pot, if you can? When I started the cooking, I set the pot on the “meat” setting with the timing you indicated. After the red pressure indicator popped up, steam started to come up through the steam vent. I thought that it was the fault of the seal not being properly seated, so I stopped the procedure, checked the silicone seal, and restarted. Same thing happened. Next, I removed the silicone, washed it in case there was some little bit of something causing steam escape, and then started the timing again. Same thing happened. Then, I wondered if it was part of the “meat” programme, so I switched to “manual”, and the steam escape through the valve stopped, and it continued to cook the meat to perfection. Is there something to do with the meat programme that could have caused this? I’m relatively new to using the instant pot, and there are still sweet mysteries…. Steam will come out from the venting knob occasionally. 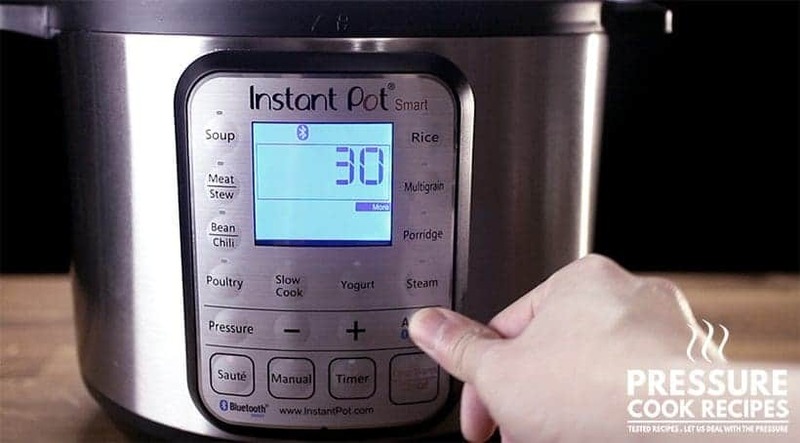 When the Instant Pot detects too much pressure is building up in the pot, it will automatically release some steam from the venting knob to reduce the pressure. Plan on trying this on the weekend, but was just wondering how this would be if you substituted chicken… have you ever tried it? A few of our readers have tried it & liked it. You will want to reduce the cooking time depending on the cut you will be using! Is there a way to add veggies to this pot roast? After the roast has been pressure cooked, set it aside and add some carrots & potatoes to the pot. Pressure cook for 3 minutes + Quick Release. The carrots will change up the flavor profile a bit so if you don’t want that, you can use the Pot in Pot method. Could I double this recipe? Just sear two 2lb roasts and then have them both in the IP? If so, would I stack them on top of each other or side by side? Same cook time? Thank you. Cooking time will be the same! Just started this recipe and can’t wait to taste it! Question : under step 5 there’s instructions saying “pour in the meat juice”. I deglazed the pot and put the browned chuck back in after adding the ingredients but I didn’t have any “meat juice” outside of the pot. Once it was browned it didn’t leak any juice . Did I miss something ? It is only a small amount of meat juice so it will be fine! Hey AMY & Jacky…this is a great sounding recipe. As soon as I get myself torn away from this computer…my wife and I are headed to the store to get ALL the ingredients for this Pot Roast. This is really making my mouth water as I type. Will update you on the final result when we finish it. Thank both of you…. for your Love and Passion for sharing your Life and Food with the World. Is there any chance you could provide the nutrition info and calories with recipes? That would be a great help to those of us trying to track for weight loss/maintenance. Thanks, the MISSISSIPPI POT ROAST looks yummy. Gotta try it. We have started adding nutrition info with calories to some of our recipes. 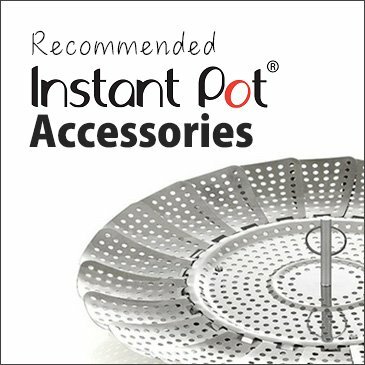 How did I even mom before the instapot? It’s like I’ve locked those dark ages out of my memory. Love the instapot, LOVE this recipe, love this page. Must try!